We have seen hovering space crafts and missile enabled drones in movies like Star Trek, Avatar, G.I Joe and so on. From these pictures it is clear that such machines can easily stay in the air at a fixed position, just above a few feet from Earth, for any amount of time. In real life, such machine applications are used as an extra utility in space vehicles. NASA deployed such machines to carry astronauts and heavy machineries from the spacecraft to the landing station. Though we have seen how the machine is in movies, in real life, it is very difficult to understand the actual movement of the hot air pressure created by the propellers, and the vortices it creates on the surface of water. To know more about its characteristics, NASA carried out some tests with a prototype lander that was made to fly as a hover up to 7 feet for exactly 27 seconds. The machine was designed to control its position for a fixed time along with its orientation and land with accuracy. The success of the experiment carried out is shown in the video below. From the video it is clear that the commands are executed by the machine independently. We can also see that the machine is self-governing the hover movement for an extended period. 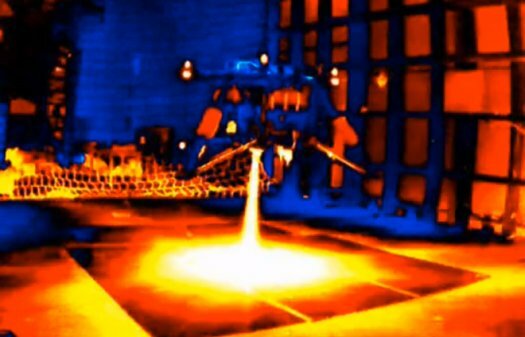 You can also see the movement of the hot air pressures created by the propellers with the help of an infrared view. You can see that the pressure is so high that it easily knocked off a NASA poster off a test chamber wall. With the success of this test, NASA officials have decided to experiment with the same lander for a height of 100 feet for time of 1 minute. By knowing more about the pressure movement of the hot air, they could create smaller and versatile self-governing landers to be used in space and airless bodies.